Climate simulation models have proven to be unreliable when their predictions, scenarios, projections, etc. are compared to the observed climate realities. A recent example is in regards to the waters surrounding Antarctica. The Southern Ocean is comprised of 5 sub-regions. This study reviewed the empirical evidence of sea ice extent and found that 4 of the 5 sub-regions experienced an expanded sea ice extent and the Southern Ocean overall did likewise. The study confirms the growing scientific consensus that sea ice has increased since 1979. In contrast to the climate models and their prognostications, these scientific observations of climate reality are opposite of what the models expected. "Whatever the true cause or causes, one thing is certain, all of the climate models have failed to predict the observed increase in Southern Hemisphere sea ice extent. Rather, as reported in the most recent report of the Intergovernmental Panel on Climate Change (IPCC), CO2-induced global warming is supposed to reduce its extent by an average of between 16 and 67 percent in the summer and 8 to 30 percent in the winter by the end of the century (IPCC, 2013). Clearly, therefore, something must be fundamentally wrong with the climate models, for their predictions to be so far off from the observed sea ice trends." Since climate models are dependent on the CO2 greenhouse gas being a major driving force in the simulations, it is not a surprise to those familiar with the subject that the simulated outputs continue to be deeply flawed. Additional climate model and failed prediction articles. As has often been the case, official climate science is now agreeing with what skeptics identified several years ago: Antarctica is not warming. The prestigious science consensus journal Nature has published a new peer-reviewed study that counters what that journal has been reporting about Antarctica for at least the last decade. This should not come as a surprise to the observant. The global warming doomsday scientists have relied on a compliant mainstream media to claim that their opinions represent the supposed 97% of settled science - an indisputable "consensus" that should not be debated. But, as in almost every scientific endeavor, the science is never, ever settled. Yet the climate science orthodoxy continues to push the catastrophic scenario that Earth's major coastal and island regions will be submerged due to the melting of the polar ice sheets found in Antarctica. Unfortunately for the consensus alarmism, this new study indicates Antarctica's canary in the global warming fearmongering-fable has actually been cooling over the last 20 years, not warming (see chart). "Natural variability was responsible both for the decades-long warming since the 1950s and more recent cooling, according to research published today in Nature. The research, led by John Turner from the British Antarctic Survey, said while the start of Antarctic Peninsula cooling in 1998 had coincided with the so-called “global warming hiatus”, the two were not connected." And what do they say next, after being severely humiliated with the empirical evidence that skeptics rely on? Well.....the consensus doomsday scientists bounce right back with their orthodoxy beliefs, based on the always wrong climate model computer simulations. "Scientists were quick to declare the results of the Turner et al paper, which covered 1 per cent of the Antarctic continent, did not negate a long-term warming because of man-made climate change...“Climate model projections forced with medium emission scenarios indicate the emergence of a large anthropogenic regional warming signal, comparable in magnitude to the late-20th-­century peninsula warming, during the latter part of the current century,” the Turner research concluded." Previous polar and sea ice articles. Article: From the science-is-never-settled department, a new study utilizing satellite technology measures Antarctica's albedo. It is found to be increasing overall, thus increasing the solar radiation reflected back into space. Ergo, there be climate cooling forces at work despite record atmospheric levels of CO2. Article: NASA temperature records for Antarctica peninsula show no real warming since the late 1980s - a 'pause' that predates the global one, despite record levels of atmospheric CO2. It's another day and another stubborn climate fact: global sea ice is not melting as expected by the experts. This chart, per the U.S. government's funded NSIDC's dataset, clearly documents the global melting pause. Unexpectedly for the IPCC and associates, the trend is flat, despite the greatest growth in human CO2 emissions ever recorded. At this point, it would be safe to say that the empirical evidence confirms that past hysterical projections of a global sea ice meltdown by global warming alarmists were without true scientific merit, due to being based on an untested and weak hypothesis that humans would cause catastrophic climate change. Way back in 1988, a NASA climate expert gave testimony that the 'high latitudes' (i.e. polar) would experience greater warming due to growth of human greenhouse gases (GHGs), including CO2 emissions. This prediction was seized upon by global warming advocates as "proof" that the South Pole's unprecedented warming would melt sea ice and cause melting ice sheets to collapse, raising ocean levels and thus submerging worldwide coastal areas. Indeed, there is strong evidence that GHGs have risen considerably - even to a greater extent then the feared 'business-as-usual' scenario NASA/GISS experts promulgated. Yet the newest empirical research completely counters the fears and beliefs of the CAGW crowd: over the satellite era, some 30+ years, Antarctica's ice sheets have slightly grown and the South Pole's sea ice extent is at record levels. Then there is the proverbial elephant in the CAGW room: the Antarctica region is not warming, per the advanced satellite technology of NASA. Those stubborn facts are indisputable and unequivocal. Yet, denial of this empirical scientific evidence remains widespread, preventing a rational debate about the real implications of the ongoing natural climate change. Note: Chart plots and trends produced using Excel. South Pole temperature anomaly dataset source (since inception date used). CO2 dataset source. Science is based on research and empirical evidence, not on speculative guesses or those "likely" predictions from computer simulations. Over the last few decades, the IPCC and its computer climate models have speculated that Antarctica was melting due to all the human CO2 emissions released into the atmosphere. CO2 emissions that were producing accelerating and dangerous global warming that was being "amplified" across the South Pole. Democrats, the mainstream media and green progressives have continuously repeated these flimsy, fear-mongering predictions as science "truth," representing the mythical "consensus." Yet, they conveniently ignore the actual hard empirical evidence and real scientific research that the American public has paid for. A brand new peer-reviewed research study conducted by MIT scientists confirm what NASA's satellites have documented (see adjacent chart) - Antarctica is cooling. Ahem...those inconvenient stubborn facts just hurt, no? "By contrast, the eastern Antarctic and Antarctic plateau have cooled, primarily in summer, with warming over the Antarctic Peninsula [C3 Ed: approximately 4% of Antarctica land mass]...Moreover, sea-ice extent around Antarctica has modestly increased.....In other words, the authors find that most of the Antarctic continent has cooled, rather than just the Southern Ocean..."
The IPCC's climate science has long claimed that human CO2 emissions are producing an accelerated global warming, with a "runaway" warming trend, which is then being amplified in the north and south polar extremes. This dangerous warming is, of course, causing the ice sheets to melt, unleashing catastrophic sea level rise, and thus swamping coastal regions and low-lying islands, as we speak! Hmmm.....despite over 845 billion tons of human CO2 emissions being added to the biosphere since 1978, that predicted dangerous warming, and associated catastrophes, have yet to materialize. A BIG-TIME FAIL, no? As many are now saying, a rather robust and very significant embarrassment for all of the "consensus" involved: including the IPCC, the United Nations' science "experts," the governing elites and bureaucrats. This huge fail is amplified because the South Pole region that includes Antarctica has done the opposite - literally a cooling temperature trend over the last 35 years. NASA's satellites have now been measuring global temperatures for a full 35 years (420 months through November 2013), including the Antarctic. The above chart documents the measured southern polar region temperatures. As can be seen, there has been a cooling trend - granted, a very tiny -0.04°C/century, but it remains far removed from the IPCC's unicorn science of "amplified" and dangerous polar warming. And not only has it not warmed, the Antarctic sea ice has grown to a record amount. Well, you might now be wondering if that imminent, catastrophic Antarctica ice sheets melting and collapse are still imminent...as predicted. Nope. Eating a huge amount of that cooling crow, the IPCC has recently labeled that outcome as "extremely unlikely".....Ooops!! In summary, those stubborn facts that are the archenemy of climate change alarmists are without mercy - after 35 years of high tech measurements, the South Pole region has nada, zilch, goose egg, naught, aught, nil, nix, nothing, null, zero, zip and zippo warming. Nuff said. Previous 'Those Stubborn Facts' postings. Additional modern, regional and historical temperature charts. Note: Download Excel spreadsheet with data used to plot chart. UAH satellite dataset used (plot of data column labeled 'SoPol'). Monthly CO2 dataset. Simply put, the IPCC's climate models and experts are unable to predict cloud formation and coverage, which makes accurately predicting climate conditions an impossible task. As a result, the models have huge problems with predicting actual polar sea ice coverage and albedo characteristics - a continuing major fail that shreds the IPCC's creditability as a reliable source for climate fearmongering prognostications. This latest study confirms that the state-of-the-art climate models have proven to be no better at predicting Arctic clouds and sea ice than their grossly inaccurate predecessors. Previous climate-model and peer-reviewed postings. Untold resources have been spent by government bureaucrats in an attempt to improve the dismal performance of the CMIP3 computer climate models. After billions being spent on these IPCC CMIP-class of models one would expect that they would have a confirmed capability to accurately predict Antarctic sea ice reality. At least that's what 5 climate scientists expected. Wrong. Read here. The IPCC was long ago charged with the objective of "proving" that greenhouse gases were the cause of global warming. The IPPC also took the lead in the well financed campaign to frighten the world's populace with scary disaster scenarios due to CO2-induced warming. One such climate calamity that the IPCC (and multiple other doomsday alarmists) promulgate is that the coastal regions of the world would be swamped by the melting polar ice sheets. However, like all other doomsday predictions, the seas rapidly and relentlessly rising and then submerging areas such as New York City has not happened, and is not even close to happening as the adjacent chart indicates. So, why have the sea level predictions failed so spectacularly? "Danish researchers are calling for the models used it [to] forecast sea level rise to be changed after their research shows that Greenland’s ice-cap is not melting more quickly, but rather in bursts...The group’s research, which has been published this week in the Science magazine, shows that the speed at which Greenland’s ice-cap melts, rises and falls in different periods...Up to now scientists have believed that Greenland’s ice was melting faster and have used the hypothesis in developing many of the climate models that are now used to calculate future sea-water levels.“The bottom line is that it’s not going to happen as quickly as people have feared...”"
Previous sea-level and failed-prediction postings. Additonal sea-level charts. Read here and here. The IPCC's global and regional climate models are based on a high climate sensitivity to a doubling of CO2 levels. As a result, the models predict a warmer Antarctica with a loss of sea ice. Using the IPCC models' output as input, another computer model thus predicted the extinction of Antarctica's penguins. Essentially, to be blunt, this is crappy science based on the familiar data processing concept known as 'GIGO'. To the surprise of no one, with the exception of most lame stream science reporters, the GIGO penguin study has now been harpooned by actual empirical evidence and Antarctica climate reality. "According to a statement from the American Geophysical Union, announcing the new research: "It turns out that past studies, which were based on computer models without any direct data for comparison or guidance, overestimate the water temperatures and extent of melting beneath the Fimbul Ice Shelf. This has led to the misconception...that the ice shelf is losing mass at a faster rate than it is gaining mass, leading to an overall loss of mass." Conclusions: Incredibly crappy penguin study based solely on GIGO computer simulations dies on the harpoon of actual empirical evidence. Antarctica and the surrounding seas are not appreciably warming from human CO2 emissions as predicted by the IPCC's climate models. Previous glaciers-ice-Arctic/Antarctica, climate-model and species-extinction postings. Read here. That the anti-science and anti-empirical evidence bias runs rampant in the mainstream media is now taken for fact. Whether it's the UK, US or Australia, the left-liberal dominated media fear-mongering on climate change and global warming, tossing empirical evidence out the window, leaves lots to be desired. The latest example is the Guardian, which reports that Arctic sea ice has declined by 75% over the last few decades - a very scary sounding decline. And they can get away with this because their readers are incredibly susceptible to most types of anti-science propaganda, such as the recent claims that vaccines cause autism. In the Arctic sea ice case though, a 75% decline would be represented by the red line in the adjacent chart - sea ice has never reached that level no matter what the mainstream press "reports." Instead, recent sea ice decline is represented by the blue curve, which by early spring 2012 had recovered to its 30-year average. "The Guardian managed to outdo itself in it’s latest foray into global warming, claiming that Arctic sea ice has declined by three quarters in the last three decades. In a series of “factoids” following an interview with pop celebrity and latest Greenpeace spokesperson for the Arctic ice, Jarvis Cocker, Lucy Seigle, the Guardian’s environment reporter, informed readers that: "Of the Arctic sea ice, 75% has been lost over the past 30 years. Last year saw sea-ice levels plummet to the second-lowest since records began. It is estimated that the North Pole could be ice-free in the summer within the next 10-20 years."" Conclusions for mainstream media bias: Climate change reporting by large media outlets is totally untrustworthy. The left-liberal-progressive political agenda prevents an accurate reporting of global warming empirical evidence. Instead of receiving objective journalism, readers and viewers are constantly subjected to fear-mongering, anti-science opinions. Previous mainstream-media-bias and sea-ice/glacier/ice-sheet postings. Read here. The predicted "accelerating" sea level rise has been a fearmongering staple of the IPCC's global warming alarmists and the mainstream press for decades. For pure hysteria sake, nothing beats the image of flooding populous coastal areas with the intent to frighten the public. Unfortunately for the alarmists, the empirical evidence does not support their grossly speculative predictions from discredited climate models. Firstly, the "accelerating" global sea level rise has not taken place as multiple research studies have documented. Secondly, the alarmist creed that the melting of Greenland's glaciers would cause devastating ocean rises has been completely debunked by a new peer reviewed study on some 200+ glaciers on the world's largest island. Conclusion: Accelerating global sea level rise from melting glaciers is not happening as predicted. The retreat of Greenland's glaciers is not a major contributor to sea level increases and there exists no empirical evidence that this will change by year 2100. Read here. Hysterical polar warming claims by "experts" has been pretty extraordinary over the last decade, including the idiotic sea ice "death spiral" prediction that is now being carefully retracted. Unfortunately, the global warming scam requires a constant flow of hysterical claims, which more often than not, prove to be wrong. Conclusion: The hysterical polar warming claims are part and parcel to the basic propaganda of the catastrophic global warming scam. Although the globe has warmed over the last 150 years, the empirical science does not support the robust lying misinformation pushed by warmists. Previous peer-reviewed and sea-ice postings. Read here and here. During a week where honest scientists and the gullible mainstream press were again whacked in the head by the infamous 2x4 of global warming alarmist corruption, new research based on empirical evidence continues to reveal that the IPCC's alarmist predictions are bogus, if not terminally corrupt. New satellite evidence shows that the Himalayan glaciers have lost zero ice for the last 10 years, which is the exact opposite of what the IPCC, Greenpeace, the World Wildlife Federation and U.S. climate scientists have predicted, and claimed to actually be happening. As one of the world's major 'Big Green' propaganda alarmist tools, the UK's Guardian had to be stunned itself to write this about the Himalayan glaciers and the related 'stunned' climate scientists. "The Himalayas and nearby peaks have lost no ice in past 10 years, study shows"..."The world's greatest snow-capped peaks, which run in a chain from the Himalayas...have lost no ice over the last decade, new research shows...The discovery has stunned scientists, who had believed that around 50bn tonnes of meltwater were being shed each year and not being replaced by new snowfall." As the sordid fakery and fabrications of a major global warming alarmist scientist, Peter Gleick, continues to embarrassingly unravel, the mainstream press also has to cope with real world climate facts - the world is not dangerously warming and causing all the exaggerated global warming catastrophes they previously reported (predicted). Previous posts about glacier-ice-sheet, failed-prediction and mainstream-media. Read here. It is a well established fact that tax-payer funded, professional alarmists blame any known worldly change/condition on anthropogenic global warming. This has certainly been true regarding the global retreat of glaciers since the Little Ice Age end. Based on the latest research though, scientists are now concluding that natural oscillations and cycles play a much greater role in glacier retreat/melt and advancement. In fact, new research has determined that Greenland's Helheim Glacier had a similarly very high natural melt during the 1930's versus the more recent melt that alarmists solely (wrongly) blame human CO2 emissions for. Previous peer-reviewed and glacier/ice sheet postings. Above Mapquest and Google image sources. Read here. The Arctic polar region is dominated by ice and water. One would expect any taxpayer funded computer model worth its salt would be able to accurately predict the climate of this simple ice and water region, no? Well...as is the case with any computer climate model simulation, peer reviewed research finds the global climate models are also worthless for accurately predicting the Arctic climate, let alone the entire global climate. Additional polar-glacier-sea-ice, failed-prediction and peer-reveiwed postings. Read here. The 'Big Green' controlled IPCC and the typical Climategate scientist have publicly claimed that the recent Arctic sea ice melt is entirely due to human CO2 emissions. The majority of climate scientists don't agree with this IPCC stance, knowing full well that other natural and human influences are at work in the Arctic. New research, by scientists from the University of Washington and NASA's Jet propulsion Lab, have now discovered that freshwater from several large Russian rivers is being relocated to certain regions in the Arctic that allows other regions to be more vulnerable to increased sea ice melt. The force that is redirecting freshwater is not human CO2 but instead nature's own Arctic Oscillation. "A hemisphere-wide phenomenon – and not just regional forces – has caused record-breaking amounts of freshwater to accumulate in the Arctic’s Beaufort Sea"..."Frigid freshwater flowing into the Arctic Ocean from three of Russia’s mighty rivers was diverted hundreds of miles to a completely different part of the ocean in response to a decades-long shift in atmospheric pressure associated with the phenomenon called the Arctic Oscillation"..."In the Eurasian Basin, the change means less freshwater enters the layer known as the cold halocline and could be contributing to declines in ice in that part of the Arctic...The cold halocline normally sits like a barrier between ice and warm water that comes into the Arctic from the Atlantic Ocean. Without salt the icy cold freshwater is lighter, which is why it is able to float over the warm water...In the Beaufort Sea, the water is the freshest it’s been in 50 years of record keeping, he said. The new findings show that only a tiny fraction is from melting ice and the vast majority is Eurasian river water." Read here. The UN's IPCC attempted to convince the public and policymakers that there was a scientific "consensus" that the last 150 years have witnessed "accelerating" global warming that is "unprecedented." Instead, the evidence now points to the IPCC and its Climategate scientists conspiring to mislead. Thankfully, the vast majority of the world's scientists do not believe in the IPCC's climate political-science proclamations and thus continue performing/producing empirical research to determine the science truth. The non-IPCC research team of Thamban et al is an example of this and the adjacent chart (click to enlarge) is a product of their research: Antarctica's modern temperatures are not unusual, nor are they rapidly warming versus what has occurred naturally in the historical past. As the evidence clearly shows, a natural warming has been taking place over the last 400+ years. The Embarrassing & Total Collapse of The IPCC's Antarctica Alarmist "Science"
The IPCC and its Climategate maladjusted scientists have long claimed that Antarctica was dangerously warming and predicted its ice sheets were close to catastrophic melting. The only problem with that characterization was its being totally wrong, big-time. In two previous postings, we discussed how both satellite and thermometer measurements document the extremely cold regions of Antarctic that are covered by ice sheets, and the fact that for the lost 30 years those areas have experienced a slight cooling. Read here. Adding to the known empirical evidence is the experiences of one of the world's topmost polar scientists, Heinrich Miller. This man is not a climate-model or computer-simulation jock; he is a field scientist who conducts his research in the polar extremes. What does he say about Antarctica? Read here. The alarmists at the IPCC and 'Big Green' like to point to the gigantic icebergs produced by Antarctica as proof that global warming is directly melting the polar continent with high temperatures. Unfortunately for the alarmists though, research by polar experts have determined the iceberg calving to be a normal condition, happening with regular frequency. Whether its deep warm ocean currents melting floating ice shelfs or the remnants of a far away tsunami, huge icebergs are a natural result. "Despite what many alarmists will say, humans had nothing to do with the PIG's latest iceberg extravaganza. The events about to unfold on the bottom of the world are, in fact, all natural and have happened countless times before. You see, NASA researchers say this latest iceberg is part of a natural cycle seen every 10 years or so on this particular glacier..."ocean measurements near Antarctica’s Pine Island Glacier showed that the ice shelf buttressing the glacier was melting rapidly. This melting was attributed to the presence of relatively warm, deep water on the Amundsen Sea continental shelf. "...Satellite photos show huge icebergs were created when the remains of the Japanese tsunami hit the Sulzberger Ice Shelf..."The impact of the tsunami and its train of following dispersed waves... in combination with the ice-shelf and sea-ice conditions provided the fracture mechanism needed to trigger the first calving event from the ice shelf in 46 years,”"
Read here. Finally, climate scientist Eric Steig and his research team have determined that the natural conditions and phases of tropical Pacific waters are the real cause of Antarctica's coastal glaciers' melting. "He [Steig] noted that sea-surface temperatures in the tropical Pacific last showed significant warming in the 1940s, and the impact in the Amundsen Sea area then was probably comparable to what has been observed recently. That suggests that the 1940s tropical warming could have started the changes in the Amundsen Sea ice shelves that are being observed now...He emphasized that natural variations in tropical sea-surface temperatures associated with the El Niño Southern Oscillation play a significant role." Despite all the research, the recognized experts and empirical evidence though, the IPCC and Climategate's Josefino Comiso are already attempting to smother the facts and truth about Antarctica in the next IPCC report, AR5. Will this level of UN sponsored climate science misinformation eventually rise to the moniker of PolarGate? Recently, we wrote of the bogus science by Josefino Comiso, an IPCC lead author, that attempted to fabricate warming across the Antarctica continent. Either due to extremely sloppy science, or massive stupidity or science corruption, Comiso and his cohorts "found" Antarctica warming and that its polar ice caps were at risk to melting. Fortunately for the world, the study by the IPCC's Comiso was thoroughly trashed by experts within the peer-reviewed community. That study has now joined Al Gore's discredited climate science in the ash heap of history. There indeed has been some slight warming in the area of the Antarctica Peninsula but the huge mass of ice sheets actually reside in East and West Antarctica, which measurements show to be cooling. As can be seen, the temperatures (listed by each red circle) during both the warmest and coldest months (January and July) are well below freezing temperatures. The major ice sheets exist in an interior environment where melting can't occur presently; and, even a future warming of 10 degrees won't cause any melting. Simply stated, West and East Antarctica are just too freaking cold for any melting to happen, with the exception of coastal areas that already are affected by moderate maritime temperatures. Despite this actual empirical evidence, the fraud-centric IPCC and its associated scientists still make claims that Antarctica is warming and its gigantic ice caps will soon melt, thus flooding the world. These are flat-out false claims designed to only promote hysteria. Read here and here. The IPCC is continuing its tradition of fraudulent bogus climate science for the 2013 climate report by utilizing Climategate-style scientists that excel in global warming fabrication and suppressing research that challenges the blatant fabrication. As the recent Climategate2.0 emails reveal, research conspiracy, science fraud bogosity and science process malfeasance is alive and flourishing within the IPCC community. How about this interesting example? Josefino Comiso is a co-author of the infamous Steig et al. research that attempted to take real warming in the Antarctica Peninsula area and then magically spread it to the rest of Antarctica using rather bizarre techniques. A team of statistical and mathematics experts closely analyzed Comiso's work and found the expanded warming of Antarctica to be entirely bogus based solely on the work's bad math and bad statistical methodology. "Jeff Id has an excellent post on IPCC AR5 use of the highly flawed Steig et al 2009. Despite Steig’s efforts to block the publication of O’Donnell et al 2010, O2010 shows clearly that whatever is new in Steig et al 2009 is not only incorrect, but an artifact of flawed math and whatever is valid was already known." The team of math/stats experts, O'Donnell et al., published peer-research that establishes, without any scientific doubt, that Steig et al. was literally garbage science, and that warming for the majority of Antarctica was irrelevant to nil. "When S09 came out, the Authors tried to discuss the Western continent warming only at Real Climate – the continental plot was entirely red though. Crack cocaine for advocates. A huge media blitz ensued proclaiming the warming of the entire continent. Questions arose in the Real Climate thread about the warming pole right away and were dismissed as not important. Objective people knew the now blindingly obvious truth that the red continent had to be an artifact of flawed math. No scientist can accept that plot without question and our initial skepticism was proven out in a prominent journal. True to climategate form, as the IPCC chapters continue to be leaked out, we can see the widespread attempt to ignore O[Donnell et al. ]10 and use the incorrect warming caused by math errors of S09 to claim that the Antarctic is in danger of melting – even though it is not." Antarctica is not warming, nor is it melting. And note that atmospheric CO2 emissions (black dots in chart) have had absolutely no impact on the regional temperatures of Antarctica. Despite the overwhelming empirical evidence and the complete peer-reviewed refutation of Comiso's Antarctica research, the IPCC chose to put him in charge of the chapter dealing with the Antarctica analysis for the next IPCC report. And the result? Comiso appears to be suppressing the the peer-reviewed research that refutes his god-awful science, the actual satellite empirical evidence, and ignoring 99.9% of all scientists who know that CO2 is not causing warming/melting in Antarctica. 99.9% ??? The vast majority of scientists look at the above chart and instantly know that the Antarctica warming scare pushed by Comiso is a fabrication - like much of the IPCC "science" the public and policymakers are now identifying as a fabrication. Other than a handful of alarmist Climategate related scientists, no reputable scientist rejects the real Antarctica empirical evidence of 30+ years of slight cooling. Read here. IPCC Climategate scientists and professional global warming alarmists have long dedicated themselves to provoking hysteria in politicians and the public. A favorite tactic has been their pushing the propaganda that current Arctic temperatures and sea ice extent are "unprecedented". In contrast, the skeptics have believed that today's Arctic temperatures and sea ice extent are not that unusual, and are likely not the result of humans. Now comes a sea ice model that confirms the skeptics' hypothesis, while devastating the alarmists' position. This model's results comport with other Arctic empirical evidence from previous research. Read here. The IPCC's climate models and its Climategate experts have long predicted that Greenland would lose ice mass due to CO2-induced global warming. Although satellites confirm that Greenland's glaciers in total have dumped massive amounts of ice into surrounding seas during recent years, these same satellites also confirm that generic global warming is probably not the cause. In actuality, if Greenland was a casualty of unprecedented global warming, then its glaciers would be losing huge ice mass in unison, as predicted by the IPCC. Instead, as the new Chen et al. study finds, there is huge variability of ice loss among Greenland's glaciers, which can't be explained by AGW. This study's scientists suggest that the gigantic variability (that wasn't predicted) is likely to be a function of regional climate/weather conditions resulting from normal interannual variability. Additional ice-glacier, failed-predictions and peer-reviewed postings. Read here. Map source here. The infamous "expert consensus" that has been proven wrong on so many occasions has another climate prediction fail. Climate scientists had claimed that sea ice coverage in the Bering Sea would shrink due to global warming and that the warmer waters would be less productive for marine life. Research by Brown et al. finds both predictions to be wrong. Previous failed-prediction, sea-ice and peer-reviewed postings. Read here. Empirical-based scientists conducted real-world field research and determined that summer Arctic ice has been less than 50% than that during most modern summers. This clearly indicates that summers were definitely warmer in the recent past, despite the low levels of CO2. BTW, this means polar bears survived this extreme ice shrinkage in the past and will do so again. It also conclusively proves that the infamous disappearing sea ice "tipping point" that IPCC climate alarmist scientists claim is lurking in the next heat wave is likely non-existent - just like the scary boogieman living underneath the bed of children. Previous glacier/sea-ice and peer-reviewed postings. Read here. The UN's IPCC is a political agency with the sole objective of producing anti-CO2, pseudo-science reports regarding global warming and climate change. It achieves this not by conducting its own experiments or research, but by collecting 3rd party alarmist research and advocacy papers from Climategate-type of scientists and green activist groups that favor the anti-CO2 agenda report. This approach to a political "science" report has often ended up producing latrine-level science, such as the discredited 'hockey-stick' temperature chart and now infamous Himalayagate affair. The IPCC's reporting on glaciers, in general, has been robustly wrong and a major factor has been an assessment based on a simple, yet spectacularly wrong, glacier hypothesis. Simply stated, the IPCC assumed that warmer temperatures would cause greater glacier ice melt, thus causing a positive self-lubrication feedback that results in a consistent, accelerated glacier movement towards open water. Sounds good except for the reality part - it doesn't work that way. 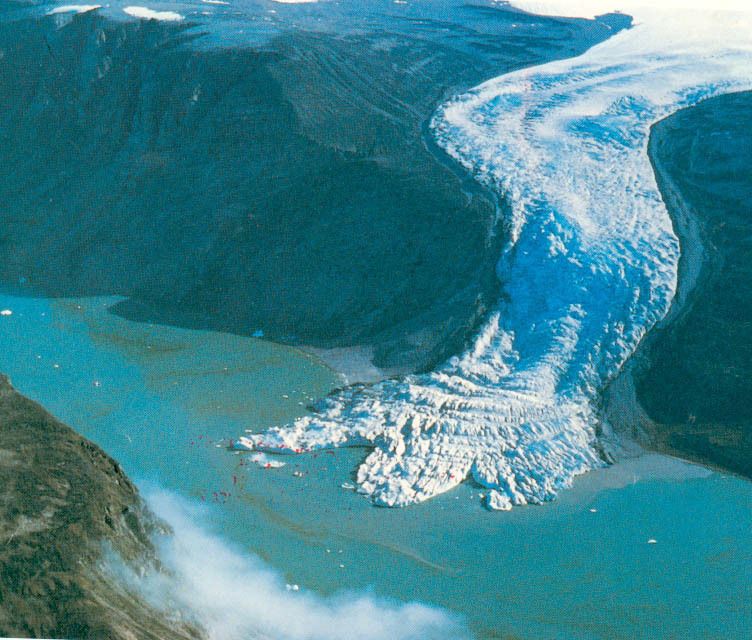 Previous glacier research had determined that Greenland's glacier flow exhibited a long-term decrease over 17 years of warming and increased melting. Sundal et al., using satellite technology, analyzed glacier movement to determine why the IPCC glacier hypothesis did not agree with the obviously contradictory empirical evidence. Additional ice sheet/glacier, failed-predictions and peer-reviewed postings. Read here. Radical green, left-wing organizations such as Greenpeace, the Sierra Club, the Union of Concerned Scientists, Environmental Defense Fund and the National Resource Defense Council have consistently been pushing the hysteria agenda of polar ice sheet melting and subsequent catastrophic sea level rises. Unfortunately for these fringe outfits, peer reviewed science and empirical evidence exposes the hysteria for what it is - pure B.S. bogosity. "The Antarctic ice sheet is one of the two polar ice packs of the Earth. It covers about 98% of the Antarctic continent and is the largest single mass of ice on Earth. It covers an area of almost 14 million square km and contains 30 million cubic km of ice. Ok, so the glaciers in question are allegedly melting at 10 cubic km per year, which is 1/3,000,000 of the Antarctic ice. That means it would take 30 years to melt 1/100,000 of the Antarctic ice, or 300 cubic km. So the ice is melting at a rate equivalent to a human losing 1 of his/her 100,000 hairs every 30 years. Approximately how many hairs are on a human head? Obviously, the number varies from person to person, but in general the answer is that the human head has about 100,000 strands of hair." Additional ice sheet/glacier and sea level postings. Read here (h/t Steve Goddard). Gullible (and/or deceptive) reporters and leftie/lib/progressive politicians have gleefully relied on the exaggerated climate model predictions in attempt to lend credence to their claims of accelerating sea level rises. The climate models projected that human CO2 increases would cause a definitive ice sheet melt, thus the seas had to rise accordingly to new, scary heights. As usual, though, the climate models were wrong. "A new reanalysis by two NASA scientists of the three standard ice-monitoring techniques slashes the estimated loss from East Antarctica, challenging the large, headline-grabbing losses reported lately for the continent as a whole...Understanding the role of East Antarctica is one key to figuring out what the ice sheets, and thus sea level, will be doing by century's end." Combine this study's results with recent Greenland ice sheet research and it becomes very evident why the empirical evidence (satellites and tide gauges) does not conform to the wild predictions of climate models; nor does the real world science conform to baseless, exaggerated "journalism" spoon-fed by the green climate activists. Additional sea-level and failed-prediction postings. Sea-level charts. Read here. Explorers floating over the North Pole during May 1926 "saw much open water at the North Pole" from the dirigible Norge. In contrast, the July 6, 2011 view from a satellite that reveals no open water at North Pole. Open water does exist close to the shorelines of land masses, which is normal during summer months. Additional strange and severe weather/climate headlines. Read here. The IPCC and climate alarmists have become well known for their hysterical and failed glacier catastrophe prognostications. To add to the IPCC's growing embarrassment, new research indicates that the Rhône Glacier is currently larger than in previous times, which doesn't lend much credence to their claims of the supposed "unprecedented" warming of the 20th/21st centuries. Interestingly, due to the glacier's melting, it has actually revealed how warm it really was in the not too distant past - under the glacier were remains of human settlements and forests that are now seeing the light of day, again. Obviously, much to the chagrin of the IPCC's Climategate scientists, the human past has experienced a much warmer climate. Using novel techniques involving measurement of isotopes Carbon 14 and Beryllium 10, Goehring et al. were able to analyze past glacier growth and shrinkage over the past 11,500 years. Additional glacier-ice sheet and peer-reviewed postings. Read here. The IPCC "consensus" science and global warming alarmists stated that Himalayan glaciers are melting at an accelerating rate and predicted their demise from CO2-induced warming would be soon. A recent peer-reviewed study finds that large glaciers in the northwest Himalayas are not experiencing accelerated warming, thus they won't be disappearing as predicted. Additional glacier/ice-sheet, failed-predictions and peer-reviewed postings. Read here. Both China and India pump a lot of CO2 emissions into the atmosphere but that's not the principal cause for the Himalaya glaciers/snow melting. The real culprit is soot (black carbon), a huge and deadly air pollutant. Instead of focusing on the atmospheric levels of the tiny, trace gas CO2, the U.S. should be helping the Asian countries with technology and science to conquer the soot menace. Additional black carbon-soot and peer-reviewed psotings. Read here. The IPCC and its Climategate scientists have predicted CO2-caused global warming for decades, which would cause the Greenland area to warm, leading to a gigantic ice melt, thus flooding coastal regions around the globe. Commonsense, anecdotal evidence, and tidal gauge and satellite data makes for convincing case that the IPCC and fellow alarmists have hilariously exaggerated this predicted catastrophe. Now comes further Greenland research that confirms the IPCC "science" failure. Daniault et al. studied the East Greenland Current (EGC) for indications that the "melting" ice cap was injecting huge amount of fresh water melt into the current. They discovered that over the last two decades there is no increase in the EGC trend, which essentially demolishes the exaggerated IPCC predicted "tipping point" outcome. Additional ice sheet/glacier, failed-prediction and peer-reviewed postings. Read here (h/t: The Hockey Schtick ). The latest research coming out of Antarctica reveals that scientists have been caught completely unaware of the substantial ice growth occurring below Antarctica, in addition to the obvious massive cumulative ice growth on the surface. This new evidence casts severe doubt on the "consensus" Antarctica climate science pushed by the IPCC that the southern polar ice sheet is at risk. Couple this with the new revelation that an ozone hole is now forming over the Arctic, much to the chagrin of IPCC polar experts, it is safe to conclude that nature is in definite control, not the UN's IPCC Climategate CO2-based science. ""There was water moving around underneath the ice sheet and it had frozen back onto the bottom of the ice sheet." Ice in Antarctica isn't supposed to form that way — it's supposed to fall from the sky as snow, and form from the top down.....Bell says scientists have known for over a decade that liquid water forms under Antarctica, and that it flows from one place to another, "but now this is showing that the water can actually change the overlying ice sheet. ".....That discovery changes the way scientists think about the processes that shape Antarctica. It could also complicate plans to study the Earth's past climate. Scientists drill down through the layers of ice to study the air bubbles, from ancient air, that's trapped inside the ice....."You think of each layer in the ice sheet being a history book and telling us what was going on on the planet at that time," Bell says. But that record is destroyed when the ice melts and refreezes, so "unfortunately, these books have been erased."" Read here. A new analysis of Greenland ice cores conclusively identifies the extremes of both the Medieval Warming and the Little Ice Age, represented by a 50-year average temperature measurement. This same measurement identifies the 1950's as a modern peak for the 50-year average, with a subsequent cooling through the mid-1990's. Additional climate-history and peer-reviewed postings. Historical temperature charts. Read here and here. A team of 22 scientists, Willerslev et al., analyzed ice cores from southern Greenland and found that the southern Greenland ice sheet survived temperatures that were 9°F warmer than current temps. Even in this much warmer climate, the ice sheet remained at least 1,000 meters thick, which debunks the alarmist's claims of future ice sheet "tipping points." Based on this analysis, the scientists concluded that the ice sheet's long-term stability is contrary to previous estimates of ice melt rapidity, such as those utilized by the IPCC climate models. The analysis also discovered that prior to ice sheet coverage, southern Greenland was a lush forest some 450,000 years ago, which is a 2 million year difference from previous expert estimates. Previous ice sheet-glacier and peer-reviewed postings. Read here. Month after month we see new revelations that the Climategate-style of science promoted by the alarmist IPCC is one of shoddiness and extremes. As with the incredible errors discovered during the infamous Glaciergate fiasco, now a new peer-reviewed study finds that Alaska's glacier loss has been (surprise!) "overestimated" by some 33%+. The new Berthier et al. research highlighted the massive uncertainties associated with climate science, and that previous IPCC proclamations about the Earth's climate conditions continue to be exposed as serial exaggerations, designed to frighten policymakers. Additional peer-reviewed and polar-glacier postings. Read here. IPCC Climategate scientists and AGW alarmists have long predicted that human CO2-emissions will cause the Arctic to become "ice-free" - a "tipping point" to runaway warming. As with almost all AGW alarmists' predictions, new EU climate research by Tietsche et al. shows the ice-free Arctic tipping point prediction to also be bogus. Additional peer-reviewed and failed-prediction postings. Other polar-glacier-ice postings. Read here. There was a period during early 21st century when Greenland's ice mass reduction was happening due to its southeastern outlet glaciers melting and retreating. Most IPCC related alarmists claimed this was evidence of the infamous climate "tipping point" and predicted imminent catastrophic sea level rises would result. Around 2006 the glacier retreats came to a screeching halt, thus stabilizing the ice sheet mass wastage and putting a lid on the typical alarmist's refrain that the Greenland ice sheet was disappearing. What stopped the glaciers melting? It was a natural, climatic negative feedback that took place (not the alarmist predicted, positive feedback induced tipping point). A 2010 peer-reviewed study [Murray, T. et al. 2010] found that warm waters from the Atlantic were causing the melting of the glaciers; the melt waters from the glaciers decreased the temperatures of the surrounding waters thus the glaciers were no longer in contact with warm waters and the melting stopped. Additional ice sheet postings. Negative/positive feedback postings. Other peer-reviewed postings. Read here. As European greens and government policymakers are frolicking and polluting at Cancun's paradise resorts for two weeks, their countries' soot emissions are destroying the Himalayan glaciers and drinking water of billions of people. Instead of fixing the black carbon (soot) pollution they are responsible for, the EU activists continue to rail about the atmospheric trace gas CO2, which, by the way, doesn't melt glaciers, sea ice or polar ice sheet caps. There are multiple studies, including this latest article, that point to soot as a prime culprit in climate warming and ice melting. "“….Angela Marinoni of the Institute of Atmospheric Sciences and Climate in Bologna explained to an audience at the 2nd Third Pole Environment Workshop in Kathmandu on October 27th, the high Himalayas are also under an onslaught from this sort of pollution. Even at altitudes above 5,000 metres (16,400 feet), soot is widespread. And when it lands on glaciers it accelerates their melting.....By analysing atmospheric circulation patterns, Dr Marinoni and her colleagues found that winds could bring soot and dust from as far away as Europe, the Middle East and North Africa. And if that were not bad enough, the Himalayan valleys act as chimneys, pumping pollutants from the Indian plains to the mountain peaks. Dr Marinoni estimates that the combined effect of this crud could reduce the glaciers’ ability to reflect light by 2-5% and increase the amount of melting by 12-34%." Read here. James Hansen, Al Gore and other global warming alarmists base frightening climate calamities (20 to 80-foot sea level increases) on the hypothesis that human CO2 emissions will cause an "amplified" increase in polar temperatures. Actual scientific researchers decided to investigate the validity of the polar-amplification hypothesis. The nine researchers [White et al. 2010] examined all the evidence and research related to Arctic temperatures and determined that current Arctic temperatures are well within natural variability and no CO2-induced "polar-amplification" is to be found. Read here. Over recent decades, it has been noted that Hudson Bay sea ice has been breaking up earlier in the summer season. These are anecdotal recollections/observations that scientists decided to investigate, using an array of advanced technology. This new peer-reviewed research regarding the Hudson Bay sea ice issue indicates there is actually no trend of earlier sea ice breakup in the area. The data analysis does show, though, a one-time shift to an earlier breakup date during late 1980's, but no trend prior or post to that event that can be attributed to AGW causes. Read here. The IPCC's Climategate scientists and Goreian alarmists have claimed that Greenland is in process of substantial and irreversible change due to the global warming over the past few decades. Putting aside the hysterical hyperbole, what is the current condition of the Greenland ice sheet? Is it experiencing unprecedented change? Recent peer-reviewed research examined the the status of the ice sheet and found that any recent change was not exceptional in the context of the past 140 years. "They state “where data do exist, we should prefer data to computer models”; they believe model projections of future ice area fluctuations are unreliable. Actually, they have some deliciously scathing remarks about climate models. “The models neglect natural fluctuations because they have no means of incorporating them, and put the entire blame for climate changes since the 19th century on human activity.”"
"Belching from smokestacks, tailpipes and even forest fires, soot—or black carbon—can quickly sully any snow on which it happens to land.....But on snow—even at concentrations below five parts per billion—such dark carbon triggers melting, and may be responsible for as much as 94 percent of Arctic warming....."A surprisingly large temperature response is caused by a surprisingly small amount of impurities in snow in polar regions."..... "When soot is there it heats the snow. It acts like a little toaster oven."..... "Black carbon in snow causes about three times the temperature change as carbon dioxide in the atmosphere," Zender says. "The climate is more responsive to this than [to] anything else we know."" Read here. As AGW alarmist after AGW alarmist predicted, and as gullible reporter after gullible reporter dutifully reported, the Arctic is warming and will soon be nothing but a pond of tepid water. Of course if these predictions were true, this would mean the Arctic melt season would have lengthened - every year the melt season would be longer. Or stated another way, every year the Arctic melt season would start earlier and end later. Additional current temp charts here. Historical temp charts here.